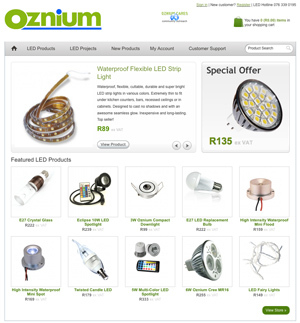 Its e-commerce shop www.oznium.co.za is the leading online LED retail store in Africa, offering professional 24/7-customer service and “state-of-the-art” order/delivery process. Oznium.co.za products can be used for industrial, commercial and home lighting. Its growing product portfolio contains architectural indoor/outdoor LED lighting, LED replacement bulbs, LED signage lighting, flexible LED strip lighting and LED drivers, LED street lights, as well as solar LED lights. The industrial range includes lights for production/ logistic halls and parking areas with high savings in energy consumption and maintenance. As a spin-off, Oznium.co.za is exclusively bringing the well-known Oznium.com LED brand from America to South Africa. Oznium.com has enjoyed more than a decade of success in the North American market, providing high-quality LED products to more than 70,000 customers with over 2,000 orders every month. Through this strong alliance, Oznium.co.za is in the position to handle all sensitive quality control, product customisation and shipment aspects of the business through its well-established and fully owned production facility in Hong Kong, The company achieves very low production costs based on automation processes, focusing on standards and well planned mass production processes. The change from incandescent to LED lighting is equivalent to the IT move from the analogue to a digital world. High efficiency, extended product life expectancy, lower energy consumption and decreased maintenance costs compared to the classical bulbs, halogen bulbs and fluorescence lamps are leading to ever-higher popularity of LED as a lighting source. In order to meet local market demand, Oznium.co.za LED lights provide an equivalent look and feel to what people have become used to over previous decades with the full benefit of LED technology. Easy-to-use LED lights, which come with CE, RoHS and other international certifications, can save up to 90% electricity and have an average lifespan of 50,000 hours. Ozniumco.za has a clear strategy to become a market leader both in terms of price and quality in the provision of LED lights for mass markets in Africa, to have a strong foothold in each of its local markets and to be able to extend to value added services. Oznium has already established an authorised dealer network in South Africa, Namibia and Zimbabwe and is open to new relationships in other domestic African markets.